Healthy. Winter. Cozy. Comfort. Food. During the winter I tend to crave hot, stick-to-your-ribs bowls and in the summer I crave cold, lighter bowls. This is a stick-to-your-ribs kinda bowl…the bowl you make when your house is frigid and no matter how many layers you have on, you can’t shake the chill from your bones. That kind of night calls for a gravy bowl. And guess what? It just happens to be good for you. For the base, I used fluffy millet. This is different from the scorched millet which was my first attempt. Fluffy millet is also different from the overcooked mushy millet which was my second attempt. When you don’t forget to set the timer and leave the room, it’s light and fluffy like quinoa, but heartier and denser, in a stick-to-your-ribs kind of way that is perfect for the colder months. If millet isn’t your thing, you can easily change up the grain. Quinoa, rice, barley, noodles, etc would all work well here. 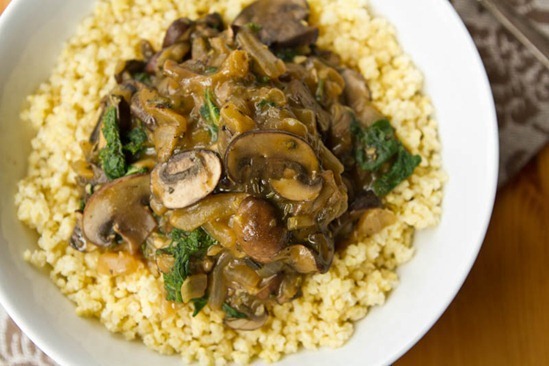 I topped the millet with a healthy but rich mushroom gravy and kale for a pop of super power. Easy but fabulous. Toast millet (optional): In a pot or skillet with a lid, toast the millet over medium heat, stirring frequently, until it starts popping. Be careful you don’t burn it. The goal here is a light toast. Remove from heat. Cook millet: Bring a medium-sized pot of 1 cup water, a pinch of salt, and 1/2 cup uncooked millet to a low boil. Reduce heat to low and cover with tight-fitting lid (with no air holes). Simmer for 15-20 minutes or so. Remove from heat and let sit for 5 minutes covered. Remove lid and fluff with fork. Set aside. Meanwhile, grab a large skillet and heat oil over medium heat. Add in chopped onions and garlic and sauté for about 5 minutes. Add the sliced mushrooms and sauté for about 12 minutes longer, stirring as necessary. Now stir in the rosemary, nutritional yeast, and tamari. Cook for a few minutes. In a small bowl, whisk together the broth and cornstarch until clumps are gone, and then stir into the mushroom mixture. Stir in kale. Cook for another 5-6 minutes or so, until slightly thickened. Portion millet into two bowls and serve the mushroom gravy on top. Approx Nutritional Info (per serving, serves 2): 355 kcals, 4 grams fat, 63 grams carbs, 11 grams fibre, 6 grams sugar, 16 grams protein. Divide the millet into two bowls and then pour on the gravy mixture on top. That’s all there is to it. All I can think while look at this is exactly what you said ‘get in mah belly!’. So no, you’re not the only one! Can’t wait to try this. Ok now, seriously drooling. Thank you for this amazing recipe, Angela! Can’t wait to try it!! I’ve never been a gravy person, but this looks so delicious! I can’t wait to make it! but seriously- 16g of protein? from where!? that’s amazing (and confusing)! I was surprised too. Its from the millet, mushrooms, and nutritional yeast mostly. Yum!!! This looks absolutely delicious! I love meals that are thrown together in bowls…you get everything you need all at once! This looks unbelievably delicious! I’ve been using your lightened up nutritional yeast sauce to tie together a lot of grain + veggie bowl lately for dinner. I could drink that stuff! Definitely be trying this one out soon too! is it the lightened up cheeze sauce by chance? Or this lightened up tahini sauce? oh wow! this looks amazing~ never had millet but i’ve been wanting to try! i’m a huge fan of comfort food :) and i totally get that whole, ‘the house is still frigid no matter how many layers i’m wearing’ thing…. Goooorgeous…wow I this looks amazing. I am saving this gravy recipe for a special occasion (i.e. Thanksgiving, Christmas, next weekend… you know). I forgot to mention I think the gravy would be great for that type of thing…it’s fairly light, so you can always adjust the seasonings to taste too. As well as make it thicker if need be with a tiny bit more cornstarch. I didn’t see when to add the veggie broth, please let me know, I’m super excited to try! its in step 4, do you see it? 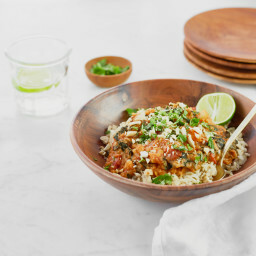 The talk of bowls made me think of the Buddha Bowl from Uncommon Goods. You can find many beautiful handmade versions on etsy if you search “noodle bowl”. This gravy would be great over biscuits or the chickpea cutlets from Veganomicon! I used to steer away from mushrooms but after hearing about how some compound in them helps protect against breast cancer, I will eat them now! 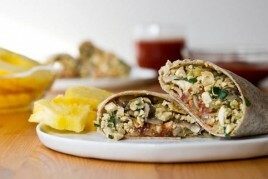 This looks like a delicious way to do incorporate more into my diet! What you need is a lab timer used by science labs everywhere. The standard one has 4 timers running, and most importantly – a clip to pin to your clothes so you don’t forget about it. I wish I had one at home! mmmm sounds delish!! Love this idea!! I love seeing grains with warm saucy toppings! That’s warm, hearty, comfort food at it’s finest! This could do double-duty for a Thanksgiving recipe, too, I think. Looks great! oohhh yes! We’ve been eating a lot of rice/veggie/sauce bowls lately, but I’m running out of ideas for sauces! All I need to make this is mushrooms, so I’ll grab some at the store tomorrow. Thanks, Angela! Looks delicious, as always! This *almost* makes me wish it was colder here. :) I haven’t had gravy in years – I love this idea of a lighter version, and I bet the meaty-ness of the ‘shrooms is perfect in it! In step 4 you say to wisk together the water and cornstarch. Do you mean the vegetable broth? I never saw the broth used in the direction portion of the recipe. Yum, looks so good! I think nutritional yeast and soy sauce are key to good gravy! My meals have been looking very similar to yours lately, only I’m out of millet and keep forgetting to get more at Bulk Barn! It’s been quinoa for me for the past couple of weeks but I’m definitely re-stocking my millet supplies to make this. 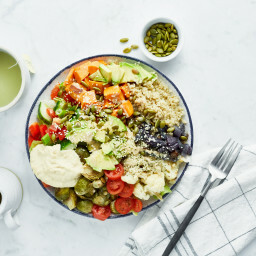 I hear ya on the Fresh thing… oh the Buddha bowl! ;) Have a great day Ange! This looks ridiculously good! I want mushroom gravy nooooow. Thanks for the cooking inspiration! Looks and sounds wonderful. I never used millet before, I guess I have a new grain to try! OK so I LOVE the look of that! Millet is fabulous. I love the texture of it, it almost reminds me of mashed potatoes in a way. Your gravy looks delicious and with those mushrooms, I’m drooling! Thanks Angela! That is a great way to describe millet. I can’t get enough of it! I just made a fab veggie burger for the cookbook using millet. comfort for me means just about anything with gravy…this sounds SO comforting! Last night was my go to meal, BBQ Chicken Naan Pizza. It’s the Mr’s favorite and so simple to make. Every time he’s like “I would pay in a restaurant for this!” Can’t get much better than that! Have you been to all three Fresh locations? Is there one you prefer over the others? I’ve had good experiences at all three locations. I think the Spadina one is a bit larger, but then again, it’s always rammed so it makes no difference. :) I don’t think you can go wrong at any of them, just keep in mind there is often a bit of a wait during peak times. Good advice…I think we will aim for a late lunch. Yes! I love bowls of goodness like this! I always load them up with tonnes of veggies and greens and they never disappoint. My problem is I just never know what to call them . . . hot salad? hot bowl? No matter, they are good all the same! Thanks for a new one to try! I just can’t get millet right. It always turns out too mushy for me. It’s okay like that in a breakfast bowl, but for a savory dinner it doesn’t go over so well. I am so good at cooking other grains- but millet and me just don’t mesh well. That mushroom gravy looks insanely good- like I could lick the screen. I’m adding that to my “to-cook” list! That looks SO DELICIOUS!! I love love love millet, it is my favorite grain by far. I also love kale and mushrooms, so I can’t wait to try this! 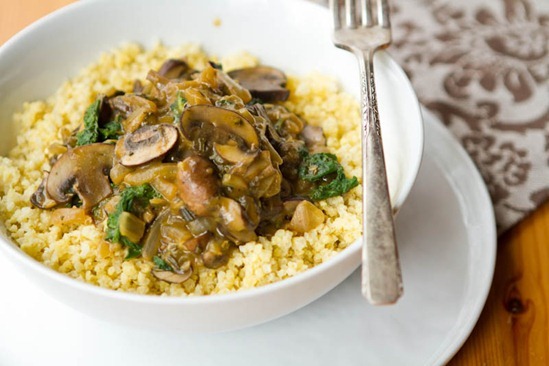 I have recently fallen in love with millet, and I always love kale, mushrooms, and gravy so this sounds awesome! 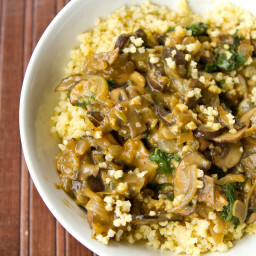 I am currently eating a bulgar wheat bowl I made, but it’s cold, and now all I want is your warm mushroom gravy bowl! Note to self: in the future, only check Angela’s website after eating your own lunch! I did the same thing the first time I made millet – it turned into a gummy, mushy mess!! This recipe gives me a reason to retry it – looks fabulous! Hey Angela! I absolutely LOVE mushrooms but my husband won’t touch them. Do you have any suggestions for an alternate vegetable I could use for him? Thank you! oh yummm, love a gf gravy recipe because I miss traditional gravy so much. My go-to winter meals are “hot plates” or basically stir fries with meat and tons of veggies and a simple sauce. Similar to yours, and yes I eat the same combo of ingredients over and over and love them more each time haha. Mmmmmm this looks so delicious!! I can’t wait to try it! I could eat mushrooms all day long. Oh and the blueberry muffins that I made on Saturday were a HUGE hit with my friends that came to visit for the weekend. They didn’t last long! Angela – one more question for you. If I use barley for this recipe (keeps me from going to the grocery store where I’ll inevitably pick up more than just millet) then do I toast it just like the millet? Thanks!! Oh my goodness… this looks *so* good. I can’t wait to try it out! Mmm! I love mushrooms, but my husband does not like them…but he is going away for work the next week & a half…so I shall be eating some saucy mushroom goodness! :-D Great timing! Do you think this would serve 4?, or do you think it should be doubled if serving 4? 2 adults, 2 kids, so no need for 4 adult servings. But, I’m worried it won’t be enough for all 4 of us. Thanks! I love mushrooom gravy so much, I made yesterday some ravioli and covered them in mushroom gravy! Delicious! I love mushrooms, gonna have to make this soon! I love eating big bowls of grains, vegetables and some sort of vegan protein for dinner. I’m also a sucker for anything involving mushrooms and kale, so the fact that you’ve combined the two into a gravy? It doesn’t get much better than that! Sounds delish, but not quite enough protein for me for a dinner meal, so I’d likely add some green lentils or chickpeas. I bet they would taste fab swimming in that gravy! I definitely need to work mushrooms into my diet more. They’re so hearty and make the perfect meat substitute! This looks delicious. Do you have a recommendation for a substitute for cornstarch? Thanks! Yup arrowroot or flour will do. Annnnnnd, I could eat this every day!! YUM! How amazing is this dish with the gravy??? OMG! Grain, protein and veggie bowls are my favourite kind of meal too! There’s something just so much more satisfying about eating from a bowl compared to a plate. 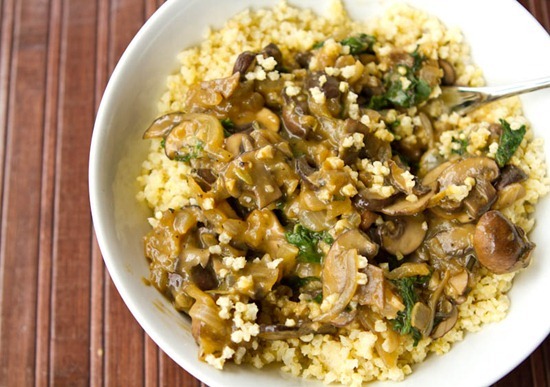 :P I’ve been on a major mushroom kick lately, so I love the looks of this recipe. I’ll have to remember to pick up all the ingredients at the grocery store this weekend so that I can make it! Is there a substitute for nutritional yeast if I don’t have any on hand? Not that I know of. It might still taste fine without it though! Oh you had me at mushroom gravy. 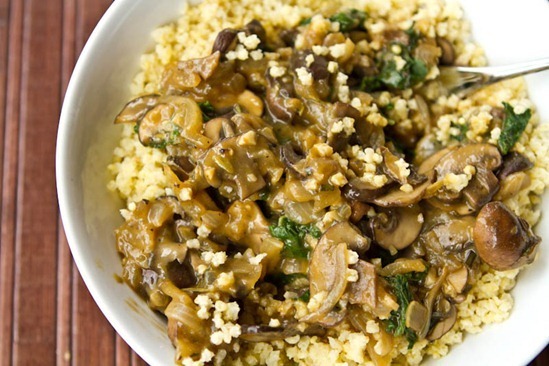 I am a total mushroom fan and this looks like the ultimate comfort meal! This look delicious. I crave exactly what you described in the winter too. It was meant to be that I read this b/c I just cooked a huge batch millet yesterday for millet burgers and I have a lot left over for just this type if meal. I tried my first attempt at Kimberly Snyder’s Millet burgers? Have you read her book? My kitchen seriously revolves around both of your recipes. 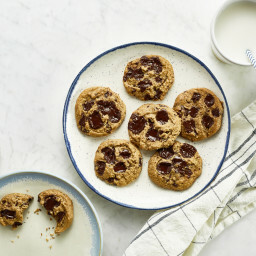 Yesterday I made your gluten free, vegan chocolate chip cookies. They turned out great and my kids had no clue they were different. Keep the GF recopies coming…I just went gf a month ago, in addition to vegan. Thank you! If it can be eaten with a spoon, my odds of liking it double. I’m going to have to try cooking my millet like this! I’ve tried millet a few times, but it always turned out far crunchier than when I’d cook quinoa. I could substitute quinoa for millet, right? I am having a girlfriend over for dinner tomorrow & was clueless as to what I was going to make…not anymore! This sounds delicious & easy to throw together after a day at work. Let me know if you like it Kelly! I made it & we both LOVED it! I definitely will be making it again. Wondering if I missed something though…I had the 1 & 1/4 cups chicken broth ready, but didn’t see in the directions where I was supposed to use it? Hey Kelly! its in step 4, do you see it? I do now, but as I sit here looking at the copy I printed a couple of days ago, it clearly says mix the water with the cornstarch. Which had me confused because I couldn’t find how much water to use & I’ve never worked with cornstarch. I have no clue how my printed copy came out this way, I almost want to scan it & send it to you so you can see I’m not a nutcase! Ahhh, technology! It was still good regardless, but I can’t wait to try it the right way next time! Yea that was a typo that I changed shortly after posting. Sorry for the confusion! I know what I’m having for dinner after I finishing cleansing! The mushrooms are screaming for me right now! Love it! Yum. That looks sooo delicious, I am bookmarking this right now. I LOVE grain bowls too! I make them all the time for fast/delicious/healthy lunches and dinners. They are just so versatile. I could just eat the mushroom mixture as is, out of the stovepan! BEST HEALTHY OR WELLNESS WEBLOG!!!! I love your blog and hardly every cook anymore without one of your recipes. Thank you for the congrats! I hadn’t heard until someone tweeted me about it. Mmmm looks delicious! I am in such kale-withdrawal here in Paris! Can you believe they don’t have it in this country? Question: I keep hearing I should soak millet (and other grains) before I cook them for better digestion. Do you soak yours? If so, for how long? Thanks! 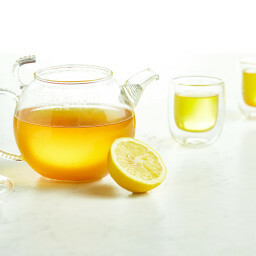 I bought the ingredients today to make this, I’m excited! This is my first time cooking millet. I am impressed by the protein content in this dish, even more reason to love it! this looks delicious! however-your ingredient list has veggie broth on it but your procedure doesnt have it in there…..do you mix the veggie broth with the cornstarch or do you mix water with it? Oh yeah, I’m totally interested in this! Oh yeah, GET IN MY BELLY!! ;) I too have been making quite a few ‘bowl’ creations. They are SO easy and healthy. Right now my favorite combo is quinoa cooked in veg broth (spinach stirred in to wilt at end) then topped with roasted veggies (cauliflower, broccoli, beets, asparagus) and my own vegan ‘cheese’ sauce (1tbsp hummus + 2 tsp nutritional yeast, mustard powder, onion powder, and cayenne with water to thin. Heat and pour over bowl.) So yum! Love and appreciate all your recipes Angela! Can’t wait ’til your coodbook comes out. Hi – it’s going to be 30 degrees celcius today in Australia and this dish still looks fantastic! Thanks, what a perfect meal. Uhhhh….it’s as if you read my mind! Was JUST looking for an awesome vegan recipe with mushrooms. YOU ROCK! I’ve been wanting to try millet for some time now! No more excuses, a great hearty filling dinner. Looking forward to the gravy…i love when the sauce soaks into your grains, don’t you? Made this tonight with quinoa. Sooo delicious!!! Thanks for the great recipe!!!! I just finished a bowl! I rarely make a recipe right away, but this looked so yummy. Super easy to make and so delicious! Thanks Angela for another great recipe. To be sure, you are not the only one who says, “Get in mah belly” Austin Powers quotes will never get old…and to be doubly sure, I would like that in my belly stat. Cozy, comfort yes, please!! So this has nothing to do with mushrooms (although i’m making this asap!!!! ), but i just wanted to let you know how much i really love your site. what it stands for and how you help so many along the way (including myself). Sometimes when I’m feeling really crappy about my road to health, I just think about you and how much you’ve accomplished and I feel better about getting back on track. Sounds yummy. When do you add in the vegetable broth. I don’t think you mentioned it. Thanks! What a fabulous looking bowl! I have been trying to add more kale into my meals, but other than soups, I never know where to put it. Will definitely try that hearty looking meal! Mushrooms are my all time favorite addition to gravy! They add SUCH great flavor and dimension to a comfort food type dish! This looks SO good. That’s what I call a perfect meal! Thank you so much for posting! If I just add a spoon to that pan of mushroom gravy, am I then able to call it mushroom soup as well as my dinner? I take your silence as approval. This looks sooo yummy! Thank you so much for sharing your amazing recipes! Going Vegan has been super easy and tasty, thanks to your site! I’ve never cooked millet… I think I will give it s try with this recipe. That gravy looks killer. YUM! You’re right-that gravy looks crazy good all on it’s own!! Can’t wait for dinner! Yummy, I can’t wait to try this. 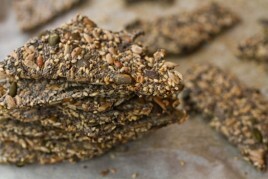 I’ve been on a millet kick lately and here’s another way for me to get my fix! Where does the veg stock come in here? In the mushroom mix? I’m making it right now YUM and I don’t see it in the instructions. Maybe I’m just blind! I just made this tonight and WOW! I used dried Shitaki and dried Morrel mushrooms since this was what I had on hand and it turned out better than I could’ve hoped for. I love all of your recipes that I’ve tried and look forward to trying more! Thank you!!! glad to hear that Amalie! This looks so good, and it’s summer here! It’s on the menu for next week. Thanks. Yum! Totally made the gravy and poured it over rice and tofu. SO comforting. This looks so delicious! Definitely looks like comfort food. Okay you are too funny! When I see good food (and I’m alone) I say, “Get in mah belly!” I got a chuckle when I saw your post and it’s nice to know I’m not alone…so to speak. Made this last night…yummmm! Apologies if someone already asked this above, but if I were to substitute the fresh rosemary for dried, how much dried should I use? I used fresh last night, but I have soooooo much left over and no clue what to do with it. So I think the next time I make this I will try it with dried. I made a similar meal and blogged about it a few weeks ago! 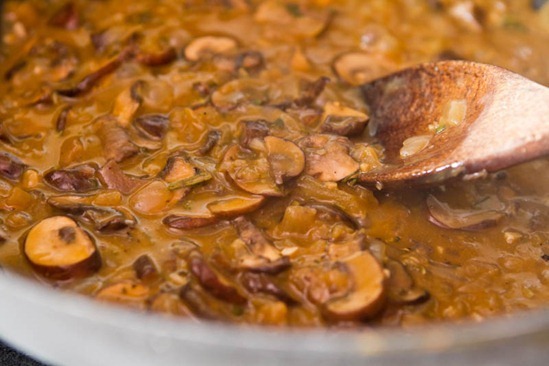 The mushroom gravy looks delicious, I have to give that a try!!! Do you think it would be possible to substitute quinoa with the millet? If so, how much quinoa would you suggest? Made this tonight and it was great. Rich and savory!! Definitely comfort food for this snowy day. Thanks so much for the yummy recipe! It’s SO good and savory. I hurt my foot so my husband whipped this up tonight all by himself in about 30 mins. Tomorrow I’ll prob. throw in some chickpeas for a little more oomph. If anyone needs a DELICIOUS and easy recipe, try this! I just wanted to say that as soon as I saw this recipe, I was determined to make it. I went and bought all the ingredients and had to wait till after classes to make it. All the while, I just kept day dreaming about it and wishing that the teacher would just hurry and finish her lecture so that I as well could get this in my belly. Got home at 9:30PM and stayed in the kitchen until this was done…it was beyond my hopes and dreams. Absolutely delicious. I shared with the boyfriend and he kept telling me how delicious this was. Definitely saving this recipe for future use. Thank you! I should have re-read this post before making my millet tonight! I ended up with the mushy variety. never had millet, is it similar to quinoa? by the way, this looks amazing. I am salivating! Finally just made this today. SO DELICIOUS. Thanks for another awesome recipe. Angela- this gravy changed my life! No, really…I haven’t had gravy in about 2 years! This was amazing! I kind of changed it around a bit and I’m going to post the recipe on my blog on Monday, but I’m giving you credit for the recipe and picture. I linked back to your blog and this blog post. That’s ok, right? me and my dad both use the austin powers line regularly, ha! Made this tonight – super yummy! Thanks for introducing us to millet! This is yummy, even substituting white mushrooms and fresh spinach for the creminis and kale (using what I had on hand). It was my first time trying millet. I too wish I had your cookbook RIGHT NOW! Made this last night – delicious as usual! So, so good. My only comment to other people who make this – make sure to really chop the kale. I would have preferred smaller pieces (rather than my lazy very rough chop). Another massive hit in my house! I swapped barley for millet (quinoaed out as of late and have yet to pick up millet), the barley made a really nice base. Stick to your ribs kind of comfort in the cold weather warning mess. With your recipes I double/triple the size and make a big pot on Sunday to feed me at work for the week. I bulked this one with the addition of leeks and it was a really great texture/flavour addition! I used dehydrated mixed wild mushrooms (a handy Costco buy) and used the water from rehydrating in place of the broth so there was some serious mushroom power (the left over broth was mixed in to the barley water). A new lunch favourite, I usually have them swooning over the Carrot Apple Soup or vegan chilli but this is the new star- and coming from a girl who never like mushrooms! I made this for lunches this week. Deelish! I added some asparagus and thyme to the mix too. The flavor is like a risotto that I used to make. I made this tonight and we loved it. I used barley, added a little more kale to the gravy and a splash of red wine. It was delicious! This was delicious!!! We made it for dinner and LOVED it! Thanks for the great, yummy, and wholesome recipes! This dish was fan-TAS-tic!! I loved the flavour of the gravy. The only thing that went awry was that my millet didn’t quite cook all the way through, but now I know for next time. Thanks for yet another wonderful recipe, Angela! Angela! This was DELICIOUS! We were out of millet, so I just stirred in a 1/2 cup of quinoa, which worked just as well. I had been craving a creamy mushroom dish, and this did the trick. Thank you! Hi – Your soups, oats, and salads are so yummy. Have you ever found a way to make a vegan clam chowder? or corn chowder? There are a few rainy days on the coast that I would love to cozy up with a good bowl of creamy soup. I havent made it but I certainly should! Just made this for my lunch – perfect for a chilly, rainy Thursday! Absolutely delicious! I had to sub in fresh shiitake mushrooms and only had dried rosemary, but it turned out great. I gave this a whirl tonight and it was a hit with my mom and brother! Thanks for the recipe! I made this for dinner tonight and it was delicious! Thanks for the recipe. I made this for dinner tonight. My husband said 1) This is five stars. I want you to write this down. 2) This is just like my mom’s roast, rice, and gravy. 3) I would eat vegan all the time if this were the standard. made this today and it was soooo yum! for once i was able to turn out something that looked exactly like the picture in the recipe, so i was quite proud :) thanks for a delicious dinner! I just tried this recipe this afternoon, and my meat loving husband flipped with delight! He practically licked the pan! My only recommendation for those of you who may have a spouse with a rather large appetite like mine is to maybe double up on the millet. Thank you for yet another “keeper”! With the recent cold snap, this was a terrific way to get some cozy! I tinkered with the recipe, but really enjoyed it. You were right: rich but not heavy. Yum! Thanks for sharing it with us! I made this tonight with couscous because my millet was mushy. I steamed more kale in vegetable broth and it was delicious! Oh my word! I made this for dinner tonight (except I used brown instead of millet, since I had it on hand) and holy smokes was it good! So rich and creamy, so decadent and comforting!! Just what I was hoping for! And while I’m commenting I must say, I too am (er, was?) a salt n vinegar chip fanatic, but I just made your salt n vinegar roasted chickpeas too, and wow! As if I wasn’t already in love with chickpeas, this just sealed the deal! And your chocolate coconut butter banana bites? Heaven! Even my non-vegan, non-banana-liking friends called these suckers “scrumptious”!! These, plus many more of your recipes have helped me find some phenomenal vegan meals I love to prepare week after week, plus show friends that not all vegan food is bland or gross! P.S. (cuz this comment obviously isn’t long enough yet) My mother is Canadian, a Montreal baby actually, and after showing her “Forks Over Knives,” I showed her your blog, once she saw you were Canadian, she was all “say no more honey, I trust this woman- she’s a Canadian!” so thanks for opening my mom’s eyes to the wonderful world of veganism as well!! aww that’s cute! Thanks for sharing. So glad you are enjoying the recipes! Angela, I have been enjoying your blog the past couple of days (just discovered it looking for a recipe). Tonight I was trying to find a millet recipe. This one sounds really incredible! Thanks! Mushrooms are one of my favorites, and as far as I know the only plant based source of vitamin D. BTW, I just cooked up a batch of millet in my rice cooker- no timers, no worries- seems like it came out perfect. Thanks for a really great blog- beautiful pictures, great looking recipes and you are an inspiration! I made this tonight. It was amazing and very comforting like you said. I doubled the recipe. I used 1/2 cup red wine for some of the broth. I also used mushroom broth instead of veggie. I don’t like kale, so I used spinach. It was so good. Very flexible recipe. It actually tasted beefy. Thanks for sharing!! First of all: Wishes from Vienna, Austria! My girlfriend and I LOVED it!! Thank you so much, that means the world to me! The mushroom gravy itself was fantastic, as it kind of brought out the flavour of the mushrooms. In addition to that I am so glad that I tried out the millet. Before, I had eaten millet only once (apart from being an add-in in baked stuff) when my Mum and I tried a recipe with it a few years ago. I had remembered it as tasting fairly horrible (too sweet for a hearty meal) and never dared to try again since then. But thanks to you I did today (the photo looked just so fantastic!) and it turned out perfectly fluffy. Thank you! This is so yummy!!! What a wonderful treat after a cool fall walk! Thanks for this great recipe. This is my first week trying to go vegan, and my husband, grown daughter, and I all thought it was delicious. I plan to try more of your recipes. Maybe we can make veganism work for us to lose weight and become more healthy. Im happy you enjoyed it Nancy! Oh man, my fiance surprised me with this the other night and it was one of the best things I’ve eaten in months! So delicious and comforting. I’ve been daydreaming about it ever since! Today we have some leftover quinoa in the fridge and I’m trying to convince him to make the gravy to go with it for supper. Thank you Deanna! That means so much to me. Yes I do think this would be fine doubled! I just wouldn’t double the salt of course, add it to taste and you should be fine. Enjoy!! This was fantastic! Very tasty and I will definitely be adding this to my weekly recipes. I doubled this for 4 of us and we could have used more. I would likely quadruple this for next time so I could also have left overs for lunch. We did have left over millet, so I wouldn’t do more than double the millet again. Just made this gravy and it is a-maze-ing. Love it. And so grateful for your recipes. I bought the ingredients for this today. Only thing is, i could not find millet. I have never had it before and the store I went to ALWAYS has a huge selection of grains…but no millet. I opted for ‘wheat berry’. What do you suggest as a replacement? Or would you totally advise against a replacement? Hey Jenn! Im sure any grain of your liking would work fine. Quinoa would be nice too. Let me know how it goes! this was absolutely delicious!!! thank you so very much. what a great idea. i have had it on my to do list for a while after seeing you re-post it and it made a perfect winter’s lunch on a cold day of harvesting for the thanksgiving farmer’s market. thanks again! I’ve had the ingredients for this in my kitchen since the weekend and finally had a chance to make it tonight! It was worth the wait, SO good. Love the combination of mushrooms with fresh rosemary, it was perfect. This turned out great but omg a little heavy on the rosemary . Am I reading it right.. 1 1/2 tbsp…way too much!! I’ve made this a couple of times now and it’s delicious! I just made this last night and all I can say is DELICIOUS!! It was the first time we had tried millet, it was easy to make and we all enjoyed it. The most wonderful part was definitely the mushroom gravy, and this is coming from a former mushroom hater! My husband just kept saying I really like this, definitely make this again! I thought I would find resistance in my daughters but they both also liked it even though they are not too fond of mushrooms…yet. I didn’t change the recipe at all except to double everything as I was making it to serve 4, one of which has a rather large appetite and wished there were even more! Thank you for the wonderfully comforting and delicious recipe! It satisfied us all and warmed us up on an extremely frigid evening! I cannot wait to try more of your recipes! Made this on Thursday night and we all loved it. (toddler included) Thanks so much! Never before have I commented on a recipe, but you have provoked me to do so! I made this last night and was beyond happy and satisfied. I am slowly turning veganish and your blog is incredibly helpful. I tell lots of people about it. Thanks for putting yourself and your creations out there for us to benefit. Hi Amy, Well thank you for the lovely comment! Im so happy you enjoyed it. I remember a year ago, I made this pretty much every single day (I wish I was exaggerating). I stumbled across the recipe again today, and I made it – amazing! Has to be one of my top Oh She Glows recipes (and that is saying something). Made it for dinner tonight – Delish! i substituted quinoa for millet and used leeks instead of onions. the gravy is thick and creamy and the mushrooms and seasonings are just perfect. thank you for this one!! it’s a keeper. Hi Angela – just wanted to let you know that I made this tonight and we loved it. My hubby loves mushrooms and onions, and said that the gravy was what really made it. I didn’t have any millet, so I used a grain mix that was really good. I do want to try millet and will definitely be making this again. Thanks for your great blog! I am new to the vegetarian/vegan world. It’s funny how I am all for ziplining or bungy jumping but when it comes to trying soy milk or tofu, I get a little scared. I am trying new things each week and I love your blog because it is helping me ease into this new world with one or two new ingredients each week. I tried this recipe last night and had no idea what “nutritional yeast” was. I googled it and found it at my local health food store. Who knew you could get a creamy taste like that without using any kind of dairy or cheese! This recipe is amazing and it hit the spot! Thanks again for a great blog and recipes! Hi Cindy, So glad you enjoyed it! I just started looking through your recipes a couple days ago and so far I have literally spent hours and have found countless recipes that I NEED to make! The battered tofu, tomato coconut soup, roasted tomato pesto, etc. etc. etc. I have a list…. Anyway I also wanted to share that last thanksgiving instead of buying vegetable broth to make my gravy I got a can of mushroom broth. Personally, I don’t like the texture of mushrooms so I never cook them, but the flavor it brought to the gravy was so much nicer than the vegetable broth gravy I was used to making. Could you omit the nutritional yeast here? I understand its necessary for certain recipes, but I have been told to avoid yeast products because I have too much candida yeast in my system naturally. I’m new (by days) to the vegan diet and I want to do it right. I think a “need to know” blog post would be very useful. Things that non vegan or new vegans should be aware of (such as iron. I just learned spinach can block iron absorption and should actually be avoided when eating other iron rich food at the same time. Who knew?!) tips for meal planning. Your experience. Cooking a vegan dinner menu when you live with a ton of carnivores! (The hubs and kids will revolt if I try and make them eat vegan. I think they would TOLERATE a cut in volume of meat in their diet but definitely not cut it out entirely or take their cheese and milk.) anyways just a gentle and hopeful suggestion. Please? And again, can you omit the yeast in this recipe or is there a suggestion for replacement? Hey Mikki, I haven’t tried the gravy without the nutritional yeast, so I can’t say for sure. I would expect it would still taste decent though! Let me know if you try it out. i made it without the nutritional yeast and it was delicious! I have made this a few times and it is so delicious! Can’t wait to make it again now that the weather is getting cool. I made this with quinoa instead and it turned out fantastic! I think it’s for more like 2 people because I ate it for lunch and dinner. All gone! My organic options are limited so I had to use regular yeast. Is that bad? I drive out of town and sock up on organics at the whole food store sometimes though. this came out so good! i used a variety of mushrooms (cremini, oyster, shitake) and it came out great! it would be a great thanksgiving dish. Oh my! I just made this today and it is so delicious! It’s very filling. Lisa, to serve 4 you need to double the recipe. Thanks! One question, please: what would you substitute for any soy in the gravy – like the soy sauce you mentioned, please? Hi Suze, I would try subbing coconut aminos for the soy. Enjoy! My bf and I just made this. IT IS SOOOO GOOD. We couldn’t find millet so we used quinoa instead. We usually don’t follow recipes but actually measured this out. Angela we will be trying more of your recipes this week! This looks amazing! Im going right now to store do get the stuff! Ive never been dissapointed once, Im sure it will be great! I made your mushroom gravy for dinner tonight and it was wonderful! I made a few changes with what I had on hand and it was still amazing amazing. I used spinach instead of kale, water instead of veggie broth, arrowroot in place of cornstarch, regular tamari, and used less rosemary. Thank you for this wonderful recipe. It’s a go-to! I’ve made this 3 or 4 times now. I altered it a bit after the first batch, made with fresh rosemary, was too intensely rosemary-ish for my taste. I used quinoa, as others did, since I had it on hand. I tried mixed dried “Italian herbs” rather than fresh rosemary the last few times and really like it this way. It doesn’t seem as if veggie broth is absolutely necessary – water can work fine. I also don’t add any salt since I seem to get enough for my taste from the soy sauce and the broth. I appreciate that your recipes are practical and use easy-to-find ingredients. I’m very happy to have found your blog! Ive made this twice in the past week already !! ADDICTED! Lol at the get in mah belly comment… I hadn’t heard that one before but now it’s stuck in my head :p You have a great writing style, great sense of humour :) Inspiring me to start my own blog someday! this looks really delicious! i was wondering if you can also make two portions and eat one today and the other one the next day for lunch at work? or doesn’t it taste good when it’s cold? Hi Angela, I made this earlier this week, with half chanterelle mushrooms and half cremini, and it turned out great ! I had it with overcooked mushy millet but well, I’ll try again and I’ll hopefully manage fluffy millet next time. Your easy and delicious vegan recipes keep me happy and well-fed in the land of cheese and meat! And they never, ever fail to impress my meat-eating guests. So glad you enjoyed it Melissa! Thanks for your feedback. I don’t know why but I really enjoyed making this meal. Actually I enjoy making many of your recipes. I think it’s because you use real ingredients. Chopping the onions, slicing the mushrooms, ripping the kale…for some reason it wasn’t a chore tonight. I’m trying to transition from my hard anodized cookware to my stainless steel all-clad set and this was one that I didn’t burn. For whatever reason, I kinda felt like a pro, even though it was a simple recipe. 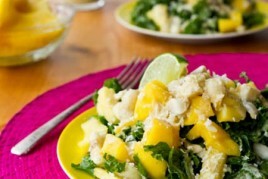 So thank you very much for this recipe – it was delicious and nutritious and my one year old daughter L-O-V-E-D it! Clearly I also enjoyed eating it! I made this when I had two friends coming into town because it was easy to make a lot of it, and holy frickin wow was it delicious. It was such a huge success with my friends, they went back for seconds, and the next time one of them visited, they requested this dish specifically. I had no idea what millet was before making this, and I was pleasantly surprised! I felt so healthy eating what birds eat, too. Hehe. The kale is healthy, the onions add great flavor. Also, I’m a huge sucker for mushrooms. They’re my single favorite food in the world. So I love adding as much rich types of mushrooms like baby bellas and criminis as I can. I made this tonight and WOW! So yummy and very filling. Plenty for leftovers as well, which I love. You are amazing! I made this last night and it was indeed excellent. My cornflour didn’t do a good job of thickening things up, but it was definitely very tasty even so. This is definitely one to do again. Does the mushroom gravy freeze well? This gravy is super duper tasty! One question: when toasting the millet do we have to have all of it popped? I did a run through with it and after cooking it seem like all the one’s that popped cooke up nice but the ones that didn’t were still a bit hard. Thanks again for the deliciousness! Amazing recipe- so simple and so so delicious! just whipped it up and it really was a comforting endless-feeling bowl! Gotta make this soon! mmmm…. goodness health. Finally tried it! It was a cold day and I work outside so I wanted some good ole comfort food for dinner. It was soooooo good. For anyone reading this…TRY THIS RECIPE!!!! I just made this tonight and it was awesome! Even my almost 1 year old enjoyed it. Thank you for the awesome recipe! Didn’t have enough mushrooms in my fridge so I used some asparagus in this recipe for some added greens and OMG! I’m in love. Also, I didn’t have any millet so I figured quinoa would do and yup! Definitely making this a staple after a long week. Nothing warms your soul like good food. I made this tonight & served over spaghetti squash. It was sooooo delicious! Thank you! I’m a big fan of this recipe. It’s cozy and comforting in the winter and just as delightful in the summertime. Major bonus that it’s a one-pot creation too! This was awesome! We sauteed green beans and added to broth and mushrooms in pan. Used baby kale. This was definitely a hefty 2 servings. Just like we like it! Thanks again! I loved this recipe! I subbed thyme for the rosemary and was out of kale so I threw in some roasted Brussels sprouts I had. Wonderful and very filling! Tried the recipe, and awesome! :) Worked out well, thank you for it! Absolutely amazing recipe! I made this for lunch today and got impatient while waiting for my quinoa to finish and so I ended up eating some directly from the pot with a spoon :) Thank you HEAPS for this recipe. I will be making it again all fall/winter long! I have severe soy allergy, other than buying the fake soy sauce do you recommend another substitute? Made this for dinner last night! I didn’t have millet but served it over a baked sweet potato… I can’t wait to eat the leftovers! I used quinoa but still it’s DELISH!! Absolutely yummy! I didn’t have fresh rosemary on hand so that was left out. 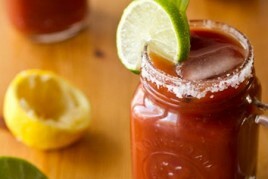 This recipe is joining the rotation most definitely! Hottest day of the year so far, and I crave hot gravy! I usually love anything on Oh she Glows but this time I was a little disappointed. I think there was a bit too much yeast which overpowered the mushroom taste. I have another similar recipe I like more than this called mean chefs mushroom gravy. I just sub to make it vegan. Aw, thanks for spreading the recipe love, Leslie! Haven’t been able to find millet in the grocery stores around us yet. Any recommendations for a good substitute? Would farro work? Hi Caitlin, The great thing about this recipe is you can easily change it up by swapping in your fave grain! I’d also suggest quinoa, rice, barley, or noodles—I think they would all work well here. Is it possible to use flour instead of corn starch? I can’t see why not! Many readers have used arrowroot, as well. When I first tried this recipe I have to admit, it was one that didn’t thrill me. It didn’t taste like comfort food, and just in general wasn’t that exciting to me, despite the fact that it had many ingredients I like, such as mushrooms, millet & kale. I was dreading the leftovers and put it off for a day. When I made them, I decided to add a large spoonful of Tofutti Better than Sour Cream after reheating the gravy. Suddenly, this is no longer mushroom gravy and instead it is Kale Stroganoff over Millet. Yum!!! I am putting this is my cookbook with the addition of the Better than Sour Cream as a very wonderful comfort food. Thanks for the recipe! This is a super delicious recipe, our whole family ate and loved it! If you like mushrooms, you will love this. Perfect for a cold day. I made this delicious recipe tonight. I was surprised that it calls for cornstarch since corn is genetically modified. I substituted arrowroot powder for it, and it came out just fine. LOVE this recipe! I have made it twice now and the second time I added about 1 – 1 1/2 c of cooked brown lentils when I added the kale. It was outrageous and so filling. It is now a staple in our winter rotation. Thanks, again! So glad you enjoyed this so much Julie! Good call on adding the lentils to boost the protein. I’m going to do this next time! Still making this and still loving it!! Thank you! So glad to hear that Larissa! This was so flavorful. It’s summer here but I had millet, kale and mushrooms to use up. Only thing I tweaked was I used mushroom broth instead of veggie broth. It was delish. This is going in the keep file for sure. Thank you! I like others am still making this wonderful dish. Tonight I made it with spinach instead of kale put it over quinoa instead of millet and it was great. It really hits the spot. Thank you for the recipe. Hey Tracy, thank you! I love how you’re mixing up the ingredients too—it’s such a versatile recipe. And that gravy, oh man. I could eat it with a spoon. Thanks again! Do you know how many cups the sauce makes without the millet? Hi Becca, I’m sorry I’m not sure about the amount the gravy makes, but looking at the ingredients I would guess 2 cups or a bit less. Hope this helps!